As the Director of Websites at Flippa, I thought it would be appropriate to share some insight into a few basic factors that can influence web valuations. After all, whether you are looking to buy or sell a website, you should have at least a basic understanding of website valuations. However, it is important to remember that a website’s value is based on both subjective opinions and objective observations. The big implication here is that the same website can be valued at different amounts depending on who is valuing it and what criteria they are using. Below are some widely accepted examples of basic factors that can influence website valuations. Generally speaking, the older a website is, the higher the value. Of course, it is not just the age that is important, it’s the authority and reputation that come with the age. Older websites are more likely to have more established link profiles and brand loyalty, as well more traffic and financial data than a newer site. Until it stopped being updated by Google, PageRank was the industry leader for establishing the authority of a website. The “authority” of a website determines the importance and trust a website has. In layman’s terms, you can think of it this way: the higher the authority, the more popular the site. And finally, with respect to this article, the higher the authority, the higher the website is likely to be valued. Since Google PageRank is no longer a viable system, below are the best alternatives to calculating a site’s authority. Moz’s Domain Authority – Domain Authority (DA) by Moz is calculated on a logarithmic scale from 1-100. Think of a brand new website with no content as having a DA of 1, while sites like Facebook or Google will have a DA of 95+. Majestic Trust Flow – Since backlinks are one of the largest factors in determining a website’s authority, it is important to make sure these backlinks weren’t paid for. If they were, this site risks being blacklisted by Google and disappearing from Google’s SERP. Ahrefs URL Rank – Although Ahrefs is a paid service, the site pays back immensely, by detailing backlinks, content scores, and even calculating site’s traffic and its sources. Traffic is one of the most significant influencers when performing website valuations. However, contrary to popular belief, it is not just a numbers game. High traffic certainly helps, but quality traffic is just as important. For instance, when performing a website valuation you might ask questions such as: Does the website pay for traffic? Is all of the traffic coming from a single 3rd party source (ex. Facebook)? What is the revenue per unique visit (RPU)? What is the bounce rate? The answers to these questions will influence the valuation. Of course, this goes without saying, the higher the quality of traffic the higher the value of the website. As a side note, this is yet another reason why anyone seeking to sell a website should ensure that they have a comprehensive traffic analysis system such as Google Analytics installed. Without a reputable form of analytics, potential buyers will be unable to perform in depth due diligence on the quality of the traffic and the valuation will decrease as a result. If you were forced to choose only one metric that you could use to perform a website valuation, then your best choice would be to examine the website’s profit. By and large, this is the metric with which buyers should be most concerned. 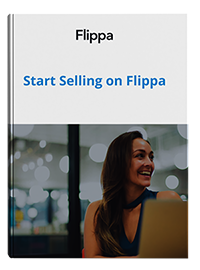 Websites on Flippa typically sell for between 12x to 18x average monthly profit, with high-end sites creeping upwards of 24x. That said, I have seen sites sell on Flippa for as high as 72x, and I have obviously seen many sites sell for far below 12x. This is where the other factors (traffic, PR, age, etc.) come into play. Of course, beyond profit, valuations should also consider other financial indicators such as revenue and expenses. Stability is an important valuation metric, because otherwise, a valuation could be heavily skewed by a few “good days.” To be clear, a website with turbulent traffic or revenue is a risky acquisition target, even more so when the seller is unable to explain the turbulence. Sustainability is another crucial factor that needs to be considered. A website that will become (or has already become) obsolete, is not worth as much as a site that has longterm growth opportunities. For example, a site that is dedicated to iPhone5 news is not sustainable. Sure it might make good returns for the time being, but in a few years when the iPhone5 is obsolete and completely phased out, the value of the site will significantly diminish. I debated about whether or not to add this to the list because domain valuation is, in and of itself, a complex, cumbersome, and arduous undertaking. Many professional domainers (of which I am not one) will advocate using various methodologies and processes. However, the fact remains that a domain name does carry value, and so it should be considered when performing a website valuation. It may come as a shock, but the simple reality is that no valuation method is perfect. The only way to get a true accurate valuation is to list your site for sale with a reserve that is the minimum amount at which you would be willing to part ways with the business. From there the market will produce an accurate valuation. In the end, your website is only worth what someone is willing to pay for it.